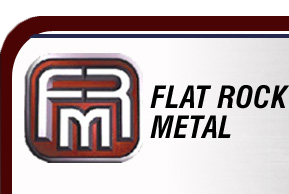 Flat Rock Metal has recently modified one of its sheet polishing lines to a sheet and blank coating paint line. The line is capable of processing carbon steel, stainless steel and aluminum sheet products. Blank sizes up to 48" wide and 120" long can be coated. In-line metal finishing and/or polishing for decorative finishes as well as optimized cleaning. Four stage wash section including iron phosphate and dry-in-place pretreatment processes. Roll applied and airless spray applied coating systems. Waterborne as well as common solvent based coating systems including acrylic, polyester, urethane, fluorocarbon and plastisol type chemistries.